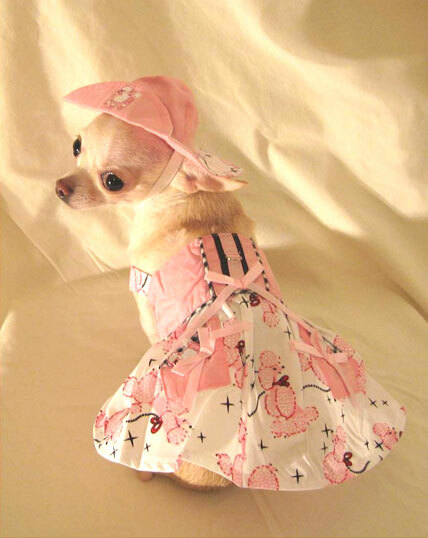 Easter's a perfect time for your dog to show off her spring wardrobe, and there's nothing more captivating than an Easter bonnet to top off that wardrobe. So whether she's going to an Easter parade or a holiday meet-up, the Easter bonnet's a must for any stroll on Sunday. 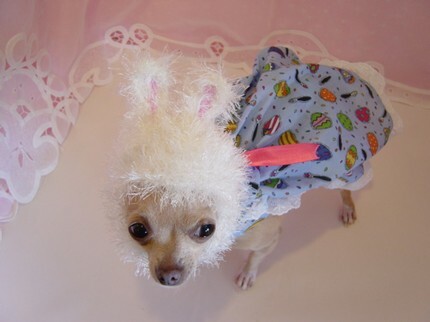 Here are 8 hot diggity dog Easter bonnets I've found, plus 2 precious bunny outfits, in case your dog wants to go out incognito! Easter more-or-less coincides with the beginning of spring, and this little bonnet (okay, hat), like the other "bonnets" featured here are perfect for any spring and/or summer occasion. 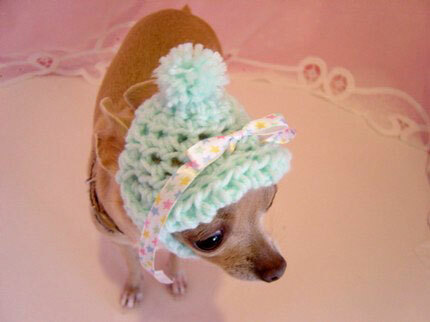 This pretty darling is available from the Happy Tails Pet Boutique for $11.99 (sale price). 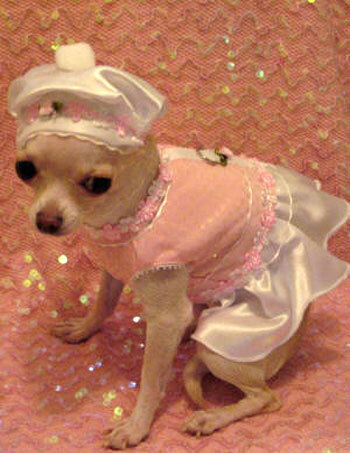 Several of the sweet bonnets I found were part of matching doggy dress sets, but that only makes them more worthy of attention. Notice the detail in these creations! All made smartly, as harness dresses, by The Pet Boutique , X-Small to Medium or Large, $34 - $36, including dress, bonnet, and matching leash. 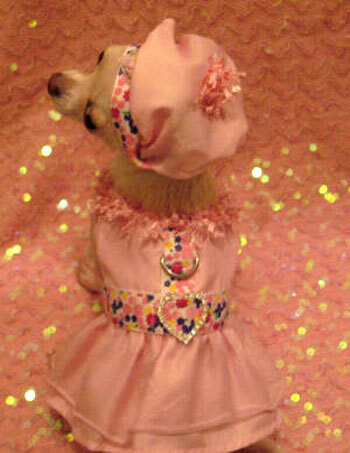 Do you think this chihuahua aspires to become a poodle? Nevertheless, the 1950's style poodle dress becomes her, as does the precious flip-front bonnet, just perfect for a sunny Easter day. 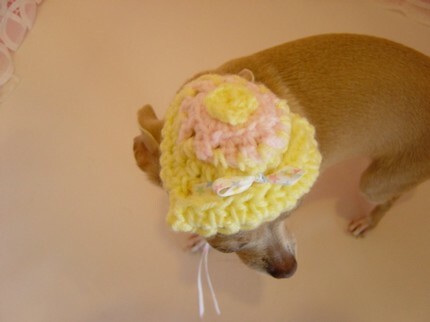 What a sweetheart Easter bonnet! Purple and white gingham with a babushka-style tie front and a big purple flower at the crown. Gorgeous little dress too. The flower row applique and the lace trim along the hairline transform the tam-style cap into a wonderfully feminine Easter bonnet. A little French twist never hurt an Easter outfit. Another tam bonnet, this time with a fringe pom pom and a floral headband. A fantasy-come-true layered dress, with matching floral belt, and a rhinestone heart buckle make this Easter outfit a smashing success. Sitting so pretty in pink! Easter bonnets and caps can be worn all Spring. And these handmade chi caps are colored with Spring in mind. Girl and boy Chis, and possibly other little dogs (and infants? ), will be ultra-chic and charming in them. These are all $10 each from Etsy's 4 Tiny Paws Boutique . 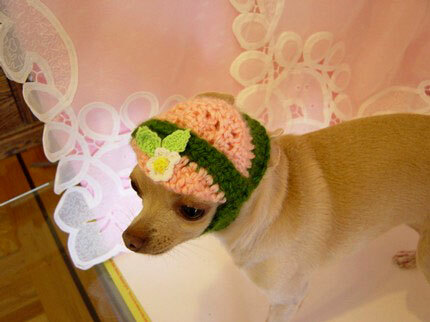 Finally, I just had to include alternatives for the not-so-bonnet-inclined Easter dog. These bunny costumes are every bit as show stopping as the Easter bonnets! 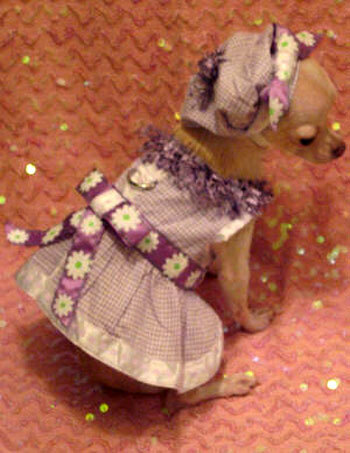 Also from Etsy 4 Tiny Paws Boutique, this Easter egg sporting dress, cotton, and lace, with a big bow in the back, is as sweet as the fuzzy bunny hat and ears it comes with. Cost is $20. One size fits all little ones; see page for measurements. 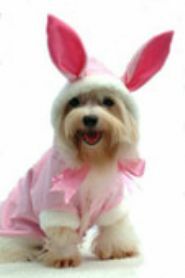 And here's an adorable bunny costume that's actually available for tiny to medium to large size dogs. From Happy Tails Pet Boutique from $35, this little bunny rabbit won't eat your lawn... but he may dig it up a bit! If you wish to purchase any of the items shown here for Easter 2008, you should request expedited shipping! Hot Diggity Easter to you and yours!